I just got this press release in the mail today. I honestly don't know what it's for. I mean it looks like a desk lamp rather than a flashlight. 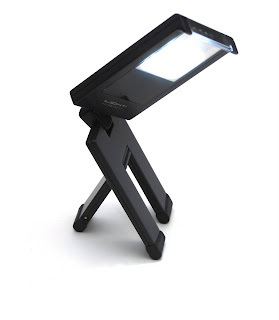 Anyways, it's the AltusLumen TRI-L Magnesium rechargeable LED light. This product has a 360 degree hinge and a foldable tripod shape. Since this product is marked as "for engineers", I'm assuming that they have to put this on their helmets or something. It also has a dual light source. Anyways, the picture is nice so I thought I might post it. For more info, check the manufacturer's site: www.altuslumen.com. This device costs $99.